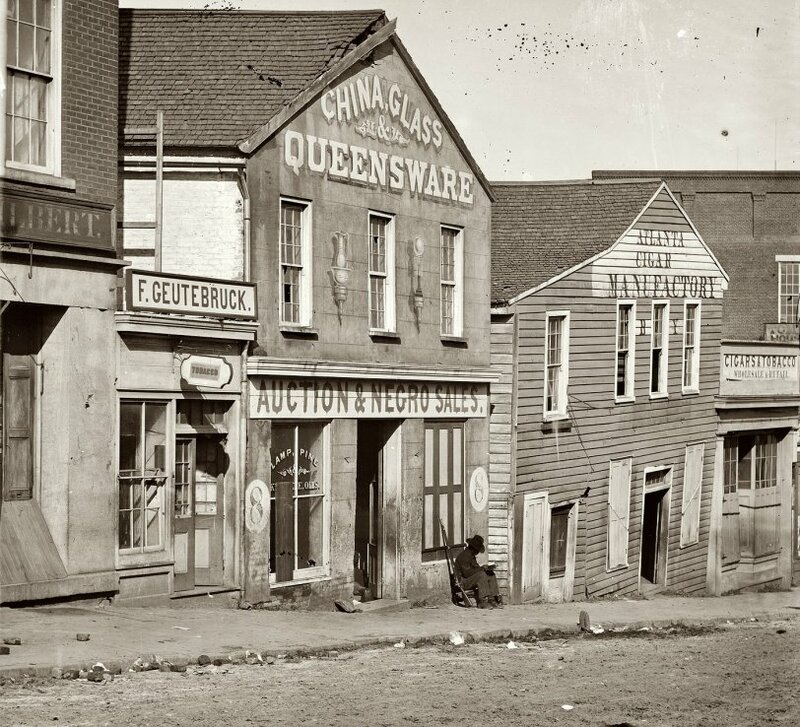 Whitehall Street, Atlanta, 1864. This photo of a black Union soldier posted at a slave auction house in Atlanta is one of hundreds taken by George N. Barnard during Gen. Sherman's occupation of the city in the fall of 1864. Many were destroyed in the conflagration that erupted upon Sherman's firing of Confederate munitions stores when he departed on Nov. 15. View full size. Submitted by Anonymous Tipster on Tue, 05/26/2009 - 3:22am. The building housed two separate businesses, Thomas R. Ripley's Crockery - which occupied the top half - and Crawford, Frazer and Co., which had its office on the lower floor. For what it is worth, Crawford, Frazer was an auction house and sold many things besides slaves and not usually, from what I can tell, from this storefront. There were other auction houses in town that dealt in the same sort of "merchandise." Just down the street from this photo, located between two buildings on the east side of Whitehall, was an actual "slave yard" where human beings for sale were more or less penned up. It all just underscores the fact that slavery - though definitely not unknown in the north - was such an accepted fact of life in the South that there was competition enough to support several such businesses. Submitted by Jass C. on Fri, 03/27/2009 - 9:54am. This picture is really creepy. I nver really thought about the suffering of those who had been sold. Submitted by Kath on Fri, 04/25/2008 - 1:33am. I have to agree, there's something peaceful and dignified about the black Union soldier calmly reading, his rifle propped up against the wall beside him that does in fact say, that this is a place of violation no more. Wouldn't it have been wonderful for the soldier to have been identified, so the generations after him could look back at their ancestor with pride? Submitted by Ray B. on Tue, 12/18/2007 - 3:57pm. I don't think this picture is sinister. A black Union soldier, armed, sitting in front of the auction house. And, what's more, he's READING. In a way it says "these days are over". Almost a propaganda picture. Or hope at least, even if those days weren't quite over. Submitted by Jonah Begone on Tue, 12/18/2007 - 10:36am. The trompe l'oeil lamps below "Queensware" are interesting... but yes, this is a sinister image. Submitted by Anonymous Tipster on Wed, 05/02/2007 - 8:20am. This is a disturbing picture. I knew about the slave trade, of course, but somehow seeing this picture with the auction house in the middle of a regular street makes it more real. I can imagine someone saying, "Oh, you want a cigar? Just go down the hill, past the place where they sell people, and the tobacconist is on your left."